Domino staff were joined by the company’s founder, Graeme Minto, as VIP guest. Forty years ago, Minto was the project leader responsible for researching multijet printing at Cambridge Consultants. He recognised the potential of a single continuous inkjet application and developed a prototype which was shown at the international packaging show, Interpack in 1978. Employing approximately 2,700 people worldwide, Domino has manufacturing facilities in China, Germany, India, Sweden, Switzerland, UK and USA and sells to over 120 countries through a global network of 25 subsidiary offices and more than 200 distributors. 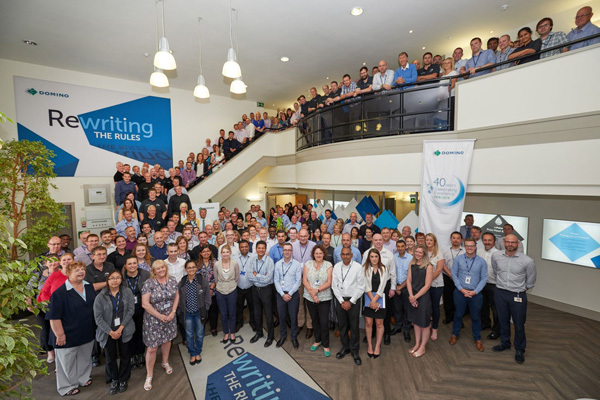 Today, 67 members of Domino’s staff at its UK HQ in Cambridge have completed over 25 years’ service, four over 35 years, 19 over 30 years and 44 over 25 years. Bond concluded: “We now have almost 850 employees at our headquarters in Bar Hill and we are extremely proud that 43% have worked for Domino for more than ten years, and 15% for over 20 years.